Today is 5 years since we got married in Malta. We have had a lot of ups and downs over the 5 years but I can definitely say that we are at a good point, well I know I am! OK, so I am going to be honest, like many people these days, we struggle with the finances and have really had to learn how to deal with it, but whether it was giving up the caffeine or whether something in me just clicked but it doesn’t seem to matter whether we have money or none, it doesn’t seem to affect me like it used to do. Every little thing used to effect me and I used to take it to heart but my husband has really helped by listening to me when I just need to put things into perspective. I know I am rambling but I wanted to say that. So this is the card that I made for Mark. 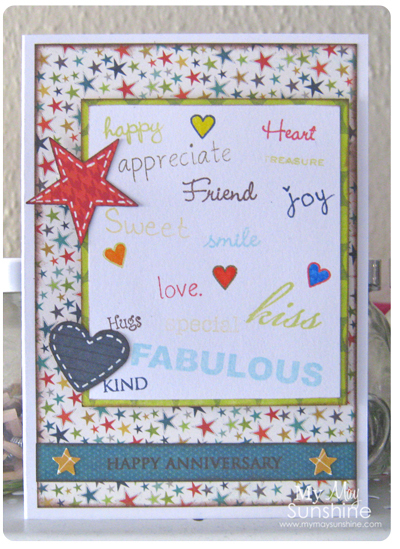 I chose to use the sketch 123 from Skipping Stones Designs. I thought that I would use lots of different stamps to create the background image rather than just using a patterned paper and tried to use ink that went with the papers. Paper – My Mind’s Eye Lime Twist out of the blue and fly a kite | Stamps – My Pink Stamper, My Mind’s eye, Hero Arts, Clare Curd, Paula Pascual | Stars and Hearts – punches | white gel pen | Ink – versamagic and colorbox. Previous Post Baking and Creating Eggs. Next Post Birthday card made using home-made scallop eyelet die.